The main system database for the File Archive is selected on this page. All the root folders (and its settings) that will be applied in the archive jobs are kept in this database. Select the database connection to be applied from the dropdown list (“MNEtestDB” in our use case). 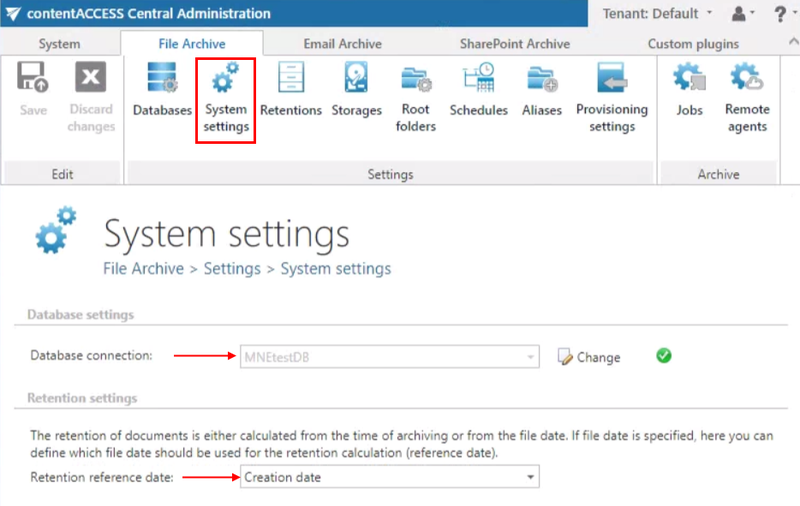 The date, from which the retention of the documents will be calculated, can be selected here. Choose the setting to be applied from the dropdown list. Save your settings. Note: A database connection already configured on the Databases page (File Archive ⇒ Settings ⇒ Databases) can be selected as a system database.